Cyberattacks are now a fact of life. Yet detection still lags. In 2015, the median amount of time attackers spent inside organizations before detection was 146 days. Why are we so vulnerable? 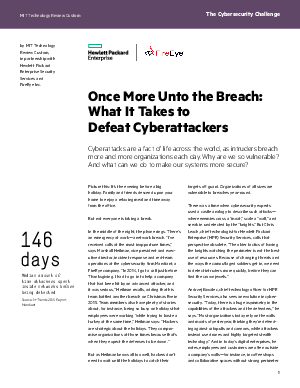 MIT Technology Review asks Andrzej Kawalec, chief technology officer for HPE Security Services and Marshall Heilman, vice-president and executive director at Mandiant, a FireEye company, what we can do to make our systems more secure.